This year we had planned to travel to Kangaroo Island and then to Outback SA to see our favourite places after so much rain, but not to be. We had to delay our trip until Marg’s shoulders fully recovered after surgery, to repair ligament tears. 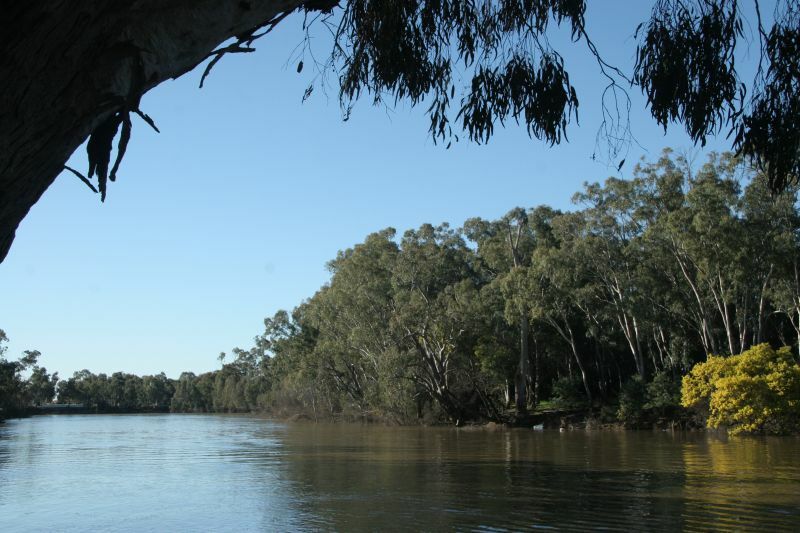 However, in a previous trip, we did manage a few days at Wahgunyah/Corowa and had a wonderful picnic on the banks of the Murray’. Then Marg developed a blood clot in her right calf, fortunately not in a deep vein, but still required a visit to emergency (7 hours, even though we had obtained an Ultrasound before we went!) followed by a second Ultrasound before the all clear to travel. Then more delays because our great friend Eric Robinson went missing while on a 10 day hike on the Highline trail in Utah. Unfortunately he is still missing after the last sighting on August 2nd, despite extensive searching by police and volunteers. The search has been scaled back to just volunteers and grave fears are held for his wellbeing, but we still hope. So we decided to keep our travels fairly local within a day of Melbourne in case we need to return in a hurry. So this blog may be less interesting than normal, but doing it will keep our mind off Eric. 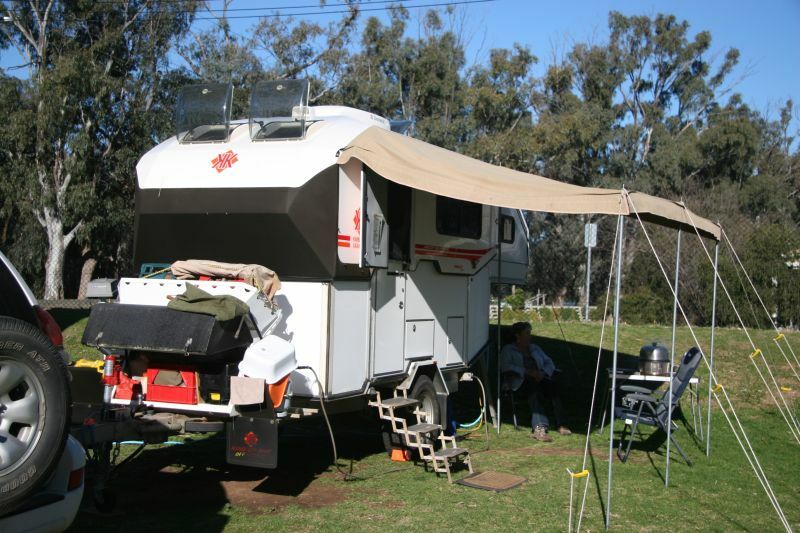 Echuca is our first stop, and given the cold nights we decided we need a power site, which we have on the Murray. 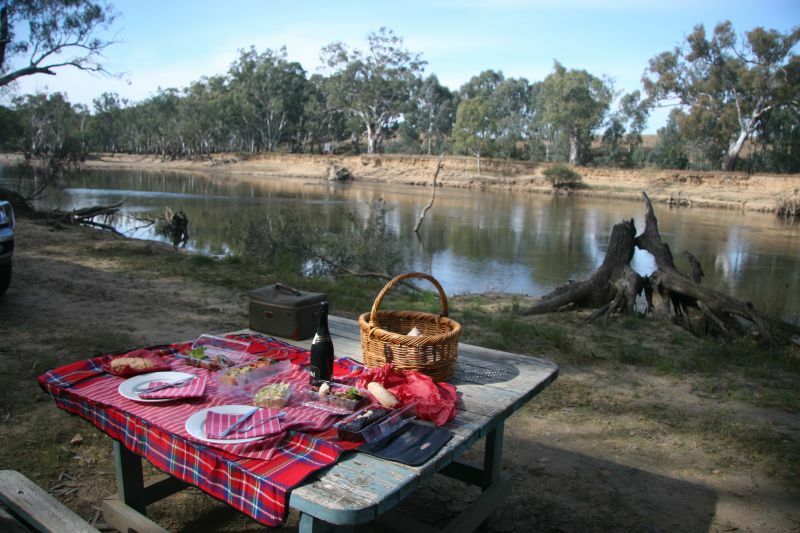 It is next to a forest reserve so we have organised a picnic hamper for tomorrow to enjoy on the banks of the Murray tomorrow. The picnic table overlooks the Murray as photographed. Great that you’ve made it up there with sparkling sunshine on your faces. Have fun and we’ll see you soon.